Nokia has finally understood that to stay in the smartphone market, it has to cut down its profit a bit & sell its phones at a lower price. Last year’s android phones from Nokia were overpriced, but this year, the company launched some of the best phones in the budget and mid-range category. Tomorrow, Nokia will launch a new phone in India which is expected to be the Nokia 7.1 Plus. It looks like the company isn’t stopping yet. 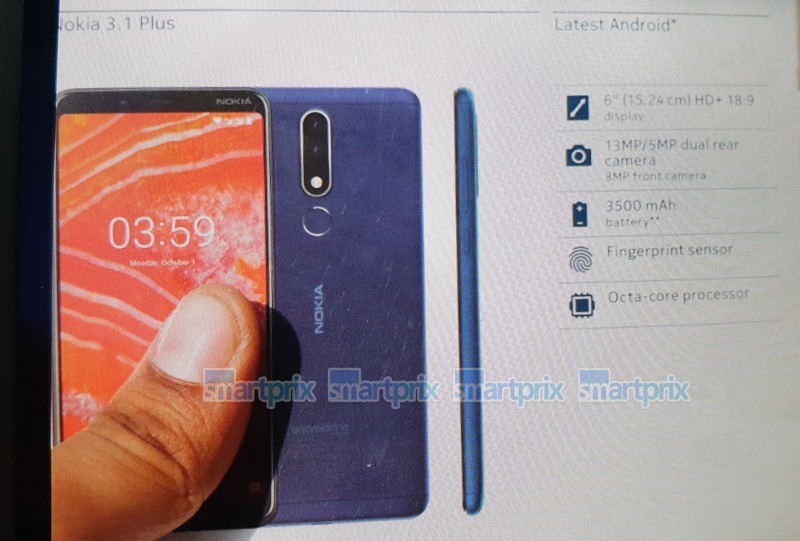 There are still a few more phones launching this year and the specifications of the upcoming Nokia 3.1 Plus just got leaked, thanks to SmartPrix. The leaked image of the retail box of the phone reveals that the Nokia 3.1 Plus has a 6-inch HD+ display with a resolution of 18:9, i.e., there is no notch. The image doesn’t reveal the name of the octa-core processor. So, it can either be a Snapdragon chip or a MediaTek one. On the rear, the phone has a primary 13MP camera, coupled with a secondary 5MP camera. The battery underneath is a 3,500mAh unit, and the phone comes with Android 8.1.0 Oreo out of the box. We don’t think it is necessary to mention that it is an Android One phone, Is it? Considering that the Nokia 5.1 Plus was launched in India at a price of Rs 10,999, we are sure that the price of Nokia 3.1 Plus is going to remain well under Rs 10,000. There is no information on the launch date so stay tuned.